Dark green leafy vegetables are a good source of many vitamins such as A, C, E and K, as well as a rich source of minerals including, folate, iron, calcium, potassium and magnesium. They are also a great source of fiber. Research suggest that the nutrients found in dark green vegetables may prevent certain types of cancers and promote heart health. The vitamins in these dark green leafy vegetables like vitamin K, A, D and E are fat-soluble vitamins. This means that these vitamins require a little bit of dietary fat in order for your body to absorb them. So, when you eat dark green leafy veggies you should make sure to add a teaspoon or so of dietary fat like olive or canola oil, cheese or salad dressing to ensure your body absorbs all of the available vitamins. 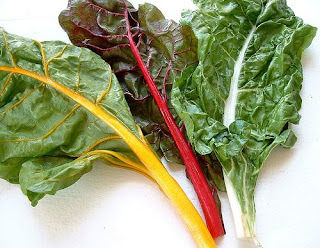 What are some examples of dark green leafy vegetables and how should you eat them? Broccoli has both soft florets and crunchy stalks, and is rich in vitamins A, C, and K, folate, and fiber. Broccoli can be eaten raw or steamed, sautéed or added to a casserole. Romaine Lettuce is a nutrient rich lettuce that is high is vitamins A, C, and K, and folate. It is best when eaten raw in salads, sandwiches or wraps. Spinach has a sweet flavor and is rich in vitamins A and K, folate, and iron. Spinach tastes great eaten raw in salads or steamed. Of course I enjoy most of these greens (mustard greens are a little spicy for me) raw in a green smoothie as well. Add some avocado as a source of dietary fat in your smoothie. It also makes it rich and creamy. Add to a soup: Try mixing leafy greens such as collard greens, kale or mustard greens into your favorite soup. Try this great Tuscan Vegetable Soup recipe. It includes spinach in addition to tons of other great veggies. My family loves it! Steam it: For something new; steam collard greens, kale, or spinach. Add water to a pot and place a steamer with the vegetables into it. Next, bring the water to a simmer, cover with a lid, and wait a few minutes until your vegetables are slightly soft. I love green vegetables! Along with fruit, they are the foundation of my diet... And yes, they are so versatile. Nice post. Green leafys are sooo good for us! Major YAY to green leaf veggies. Powerful!